There are many great places to eat in Eureka Springs, Arkansas. For a full list, visit Eureka Springs Chamber of Commerce! 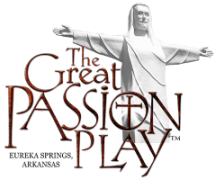 Enjoy wonderful food in The Great Passion Play's Great Hall Buffet. Pulled pork, ribs, chicken, a vegetarian dish, starches and vegetables, a full salad bar and dessert bar, as well as beverages make it not only a convenient place to eat, but also a delicious place to dine. It's all-you-can-eat! $14.45 for adults, $13.45 for youth (ages 12-16), and $7.50 for kids (ages 4-11). Dinner is served from 4:30 PM - 7:30 PM each day the Play is performed (4:00 PM - 6:45 PM after Labor Day). For more information, call 800-882-7529.